Tonto Dikeh and Oladunni Churchill. 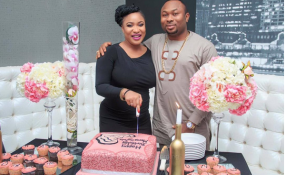 Churchill Adekunle, the ex-husband of controversial Nollywood actress, Tonto Dikeh, has once again spoken about their crashed marriage and how they met at a Lagos nightclub. "I met Tonto at my brother's birthday party back in 2014, and she became pregnant three months after we met. When I met Tonto, I was already one of the most successful young millionaires in Africa," he said. He said their marriage was plagued with "several frivolous claims of falsity, ranging from domestic violence to false allegations." "We broke up in 2016 at a house, I newly acquired for my mother in Lekki, Lagos State. I never laid my hands on her. I have never done that in my life before. She made up those things to discredit my philanthropic works. "I am from a proper disciplined Yoruba home. I was well trained and brought up under the fear of God. Marriage isn't by force and so I encourage the entire public to shun the baseless sponsored social media propaganda which the actress has continued to fuel," he said. By June 2017, Tonto's dad returned her traditional marriage bride price to his ex-son-in-law.